What a Day to be Alive: 3.5 miles baby! I have a secret weapon to being able to run. His name is Conan O'Brien. If you're married to me or related to me, you may be sick of my semi-obsession with Mr. O'Brien. But, hear me out. I was devastated and pissed that NBC didn't do the honorable thing and keep him on as host of the Tonight Show after canceling Jay Leno's stupid 10pm show. I felt if they were really interested in giving him a chance, they should have given Conan time to improve his ratings without the terrible lead-in he didn't get from Jay's stupid 10pm show. Plus, anyone who had a devotion to Jay Leno (which I really don't get, the man is just not that funny), never had to adapt to life without him. 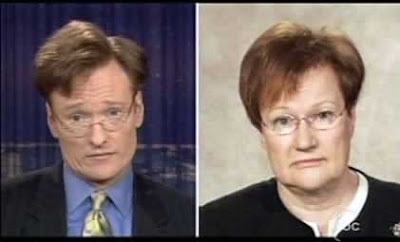 They didn't have to give Conan a chance because their guy was still on TV. But no, NBC gave Jay Leno back the Tonight Show and Conan went off in style and gathered an insane and intense following of people who loudly supported him in the process. Myself included. I will admit that while I watched Conan's version of the Tonight Show, I didn't do so regularly. I watched it every now and again, but was always entertained and laughing. So when it went off the air, I was sad (like a lot of America, I think) that I hadn't been a more loyal follower. I was so distracted by the show that I didn't realize that by the time it was done I had run nearly three miles! So when an opportunity presented itself for me to get my hands on every single episode of the Tonight Show with Conan O'Brien, I jumped at the opportunity. Now when I head to the gym and I know it's a cardio day, I transfer an episode from my external hard drive and then once there, I connect my iPhone to the treadmill and get to see the entire episode play out on the treadmill screen while I run! I've also found that if I don't focus too much on the speed, I can go last much longer. In the past, I've put so much pressure on myself to run a certain speed, to look a certain way, etc. It's so exhausting to have all these expectations. As an aside, I'm working on changing my attitude away from having expectations but instead, to setting intentions for my workouts (another thing I've learned from Mandy Ingber). Lately, my intention is set on completing the workout the best way for me- not focusing on speed or miles, but on lasting through an entire episode without walking. I know that walking wouldn't be bad, but I really really want to work on endurance and powering through that mental block I often put on myself. When one voice chimes in with wanting to walk, the stronger voice chimes in and reminds me that I can do it- I can keep running until I hear Conan closing out the show, "Bye everybody bye!" Am I crazy? Absolutely. Do I care that this is what it takes to get me to keep running? Not even a little bit. I'm just grateful I've found something that helps me stay at it, push beyond my trash talking side and run for more than three f'n miles! PS- As an aside, it's nearly impossible to imagine what my life was like before I started watching Glee.